As soon as your website amasses a sizable amount of users - probably somewhere around 50,000 or so - you're going to require two different types of emailing services. One for mass email (emails sent to your entire user base) and one for transaction email (emails sent to individual users after an action such as placing an order). The reason you need a separate service for mass emailing is because sending emails is both CPU-intensive and time consuming for your servers. The thredUP dev team made the switch to a 3rd-party service after we tried using our servers for sending out a promotional email to our first 100k users. The email took about 4-5 hours to complete and we even spun up extra Amazon EC2 instances to help fire the emails off. Considering the email was a 24-hour site-wide promotion, it created an awkward user experience as some users had more time to use the promotion than others. Additionally, when people started talking about the promotion on Facebook, some users started to write in wondering why they didn't receive the promotion. We knew at that point we had to switch to a service that scaled better than our own so we made the switch to MailChimp. Services such as MailChimp or ConstantContact are built to send out hundreds of thousands of emails in a matter of minutes, which is exactly what we needed. I had used ConstantContact at a previous job and while it got the job done, it was expensive and outdated. For an example, if you go to ConstantContact's developer docs, here are the library wrappers they offer: ColdFusion, PHP, and C#. So if you built your website 10 years ago, their libraries are probably relevant (sorry PHP). When you compare this to MailChimp, which has an entire mini-site dedicated to their API documentation , the decision for who to choose should be obvious. As it currently stands, the thredUP Rails app is integrated with MailChimp to add/remove users to our mailing list based on the email preferences they have chosen. If we send email through MailChimp or manually through our app, the user's email preference stay synced. This is just one of the many ways thredUP has integrated with MailChimp through their API. Similar to mass emailing, you can get away with sending transactional emails on your own for a while (just make sure you're doing background queuing as the sending of an email should never be reflected in a user's page response time). Since these emails are sent on the fly (i.e. moments after a user has placed an order) the hardware requirements are much less than mass emailing as the computational load of transactional emails is spread out across the day. The reason you make the switch to a service that handles ad hoc emailing isn't because of a lack of hardware infrastructure (at least initially), it's because there are other factors at play once you're sending out thousands of emails a day to different domains (Gmail, Yahoo Mail, Hotmail, etc.). You have to start worrying about ISP monitoring, IP white/black labeling, and SPAM reports. These issues can allow an email provider like Hotmail to throttle or completely stop your website's emails from going through to the user's email inbox, which creates a lot of user experience problems (i.e. try resetting your password at any website without receiving email). What if you're a data-driven company? Are you going to build an in-house email analytics suite? I'd hope not. For the reasons I mentioned and many more, it's better to pay someone better at delivering transactional email than you are. Initially, we made the switch to SendGrid. SendGrid was great to us. 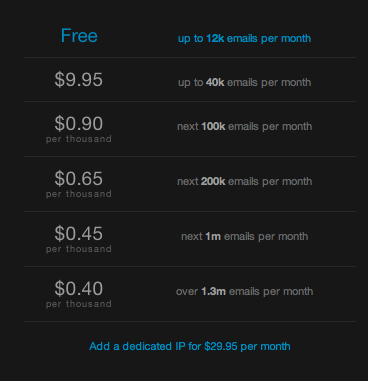 Good pricing, good metrics, good API, and much more. We used SendGrid for over a year, but it was lacking one component we desperately needed for our marketing team - online email editing. Given that thredUP is a data-driven company, it shouldn't be a surprise that we run a lot of A/B tests. Testing different email subject lines, call-to-action buttons, and headers are all very easy to change....for developers. Developers quickly became a bottleneck for the marketing team to roll out changes/updates to emails. Even if there was just a typo that needed to be changed, someone from the marketing team would have to ask a developer to make the change in the code and deploy the changes before the typo was fixed. That process wasn't fast enough and no developer wants to be updating emails all day so we started looking for an email service that was transactional and provided an online interface for editing email templates. Enter Mandrill. 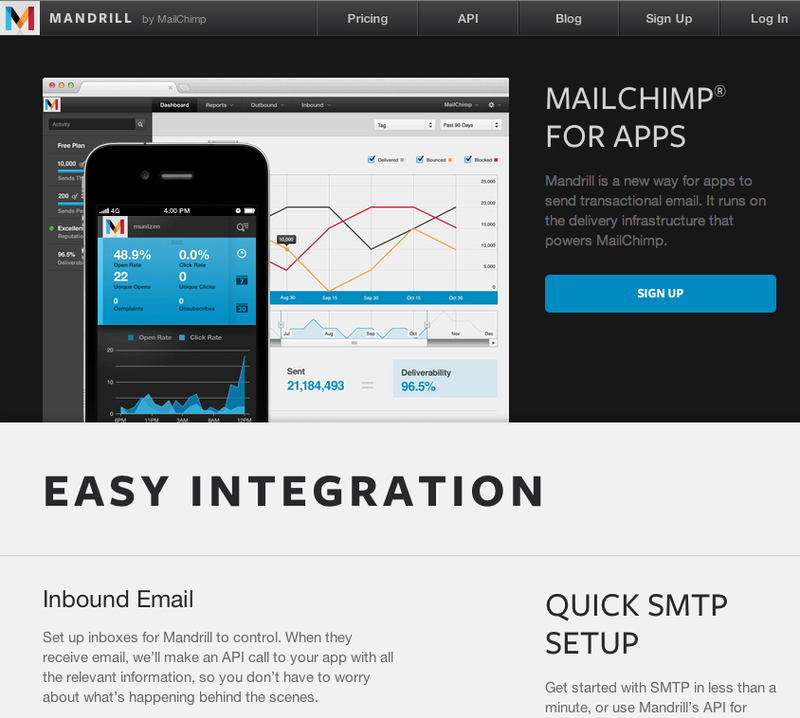 Mandrill is MailChimp's new transactional email service. It's awesome. I'm a big fan of Mandrill for a number of reasons. First, let's start with their online email editor. Through their interface, you can view all the emails you have put in their system, edit/delete/publish any email, and add new ones at will. This allows non-developers to go in and make text changes and if they have HTML experience, they can edit the entire email. If you're wondering about dynamic information in an email (user's name, order totals, etc. ), don't worry as they've thought about that as well. When your app sends the API request to Mandrill, you pass in the dynamic data and they inject that information into the email for you. Suggestion for the Mandrill team: it would be nice if there was some sort of templating partial system. We have shared layouts for a bunch of our emails and when we want to change the design, we're forced to update every email for that layout. Next up is their customer support - so far it's been stellar. This past Saturday I noticed a number of our system emails weren't going out and from our Mandrill dashboard I could tell it was because we exceeded our hourly quota. We made the mistake of queuing up an email to 80k of our users using their transactional system and since we're still new to Mandrill, that exceeded our hourly quota, which they have in place to ensure no one abuses their system. I contacted their customer support team to see if there was something they could do to make a one-time exception. Within 15 minutes they had already responded and temporarily removed our hourly limit to flush out our queue. It's re-assuring to know that in the event something goes wrong, their technical support team is accessible and able to take action. I can't speak for the Android version, but iPhone's app design and UI is great. If you're like me, the more remote access you have to the vital stats of your app, the more you feel comfortable getting time away from your computer. Lastly, their pricing is very affordable. 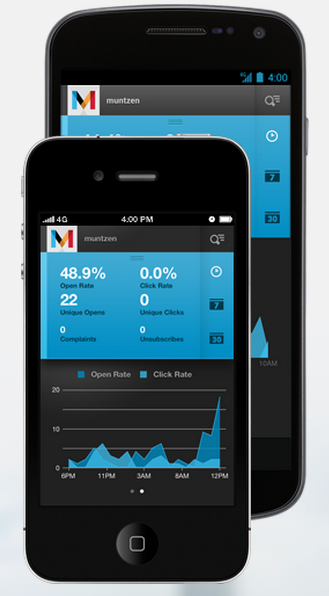 If your website is small, there's a good chance you can integrate with Mandrill for free. When I noticed they had a free tier, I integrated Mandrill into my website's contact page, which took all of 2 minutes to configure. I plan on doing a follow-up post on how to install Mandrill for your Rails app as well as talk about some of things their API has to offer. If you have any thoughts about Mandrill, please comment below!